This biography of a living person needs additional citations for verification. Please help by adding reliable sources. Contentious material about living persons that is unsourced or poorly sourced must be removed immediately, especially if potentially libelous or harmful. 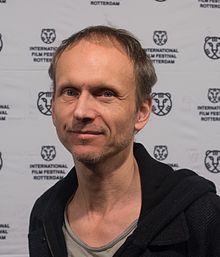 Julian Rosefeldt (born 1965 in Munich) is a German artist and filmmaker. Rosefeldt’s work consists primarily of elaborate, visually opulent film and video installations, often shown as panoramic multi-channel projections. His installations range in style from documentary to theatrical narrative. Julian Rosefeldt studied architecture in Munich and Barcelona. After receiving his diploma in 1994, he began working in collaboration with fellow Munich graduate Piero Steinle. Rosefeldt’s work consists primarily of elaborate, visually opulent film and video installations. In most cases, these installations are shown as panoramic multi-channel projections. They range in style from documentary to theatrical narrative. In Lonely Planet (2006), for example, the artist portrays a hippie-ish Western backpacker on a trip through India; as he moves through a series of clichéd sequences, including a frenetic Bollywood-inspired dance number, the camera periodically pulls back to reveal spotlights, dressing rooms and other filmmaking necessities. Rosefeldt primarily uses 16-mm and 35-mm film and has often worked in close cooperation with the cinematographer Christoph Krauss. Rosefeldt has lived and worked in Berlin since 1999, when he relocated as Artist in Residence at the Sammlung Hoffmann. In addition to his art production, Rosefeldt also works with the Schaubühne am Lehniner Platz,often collaborating with its head and creative director Thomas Ostermeier. In 2009, Rosefeldt was invited as a guest professor by the Media Art and Media Design faculty at the Bauhaus-Universität Weimar. Since 2010, Rosefeldt has been a member of the Bayerischen Akademie der Schönen Künste in the division of Film and Media Art. Since 2011, he has been professor at the Akademie der Bildenden Künste in Munich. Rosefeldt has exhibited internationally since 1997 at the Bienal de São Paulo (2004), Athens Biennal (2007), the P.S.1, New York (1998), Kunst-Werke Berlin e.V. – Institute for Contemporary Art (2004), the Royal Academy of Arts, London (2008), and the Kunstmuseum Bonn (2009), amongst others. Rosefeldt’s first solo show in the United States was presented in 2009 by his ARNDT Berlin, in the space of Phillips de Pury & Company. His videos were seen in Montreal in 2018. ^ "JULIAN ROSEFELDT". arndtfineart.com. Retrieved February 21, 2016. ^ "JULIAN ROSEFELDT'S BIOGRAPHY". saatchigallery.com. Retrieved February 21, 2016. ^ Karen Rosenberg (August 21, 2008), Now You Perceive It, Now You Think You DoNew York Times. ^ "Julian Rosefeldt". Noiregallery.com. Retrieved February 21, 2016. ^ "ALEXA on MANIFESTO video installation". arri.com. Retrieved February 21, 2016. ^ "Julian Rosefeldt American Night". YoungProjectsGallery.com. Retrieved February 21, 2016. ^ Roberta Smith (January 26, 2008), Loud Crashes, Dignified Stereotypes and a Touch of Wagner New York Times. ^ "Julian Rosefeldt". www.julianrosefeldt.com. Retrieved November 24, 2018. This page was last edited on 24 November 2018, at 17:06 (UTC).